After you have successfully traveled to the Otherworld, the next step is to seek your animal guides. These are the beings in animal form that will help guide you in your travels and aid in your healing and growth as a hedgewitch. Some hedgewitches consider their animal guides to be their familiars. This is a perfectly acceptable viewpoint, especially if you do not have a familiar within our realm like myself. I have three beautiful cats, but none of them are familiars, at least not yet. The verdict is still out on little Charlie as he is still a kitten and hasn't reached maturity yet. But I digress. Animal guides sometimes referred to as a power animal or totem, come in many shapes and forms and can change over the lifetime of the witch. They can be birds, fish, insects, or mammals, but in general, they are wild animals, not a domesticated pet. However, it is not unheard of for a hedgewitch to have a dog or cat as their animal guide, but it is uncommon. Furthermore, it not unheard of for a mythical creature to be your animal guide, but again, this is rare because you animal guide will often appear within our realm to guide and assist you, and mythical creatures have a hard time passing successfully into our world. Some say you choose the animal guide, but I have found that 99.99% of the time, the animal guide chooses you. Furthermore, an affinity toward an animal does not necessarily mean that particular animal is your animal guide. For example, my favorite animal is the maned wolf, but I haven't seen it show up as an animal guide, at least not yet. You may think your animal guide is a bear, wolf, or eagle (which most people tend to think because they associate animal guides with Native American culture), but your guide or guides may very well be a turtle, clownfish, ox, or rabbit. So what is the role of an animal guide? 1. They are our trusted friends. Your animal guides are there for you to lean on whenever you need them. They are there to help you answer questions, aid in magical workings, give you confidence, and stand by your side, no matter what you do because that's what friends are for. 2. They are our guides, NOT our controllers. You animal guide will never intervene unless your life is in danger or you ask for assistance. They are not self-seeking. Their role is that of a mentor; to advise and suggest based on their lifetime of experience. 3. They are our escorts in the Otherworld. Your animal guide acts as a travel guide through the Otherworld, keeping you safe in the process. 4. They are conduits; they help aid and direct our energies and channel the energies of the Otherworld so we may effectively see them. When you finally travel to the Upper Realm, your guides will help bring this realm into focus for you. Those beings operate on a much higher frequency so your animal guide will act as a mediator or translator to bring the picture into view for you. 5. They are our bodyguards. This is probably the most important role outside of being a mentor. Your animal guides will protect you, both in and out of our realm, from harm as much as they possibly can. There are hidden dangers in the Otherworld and it is imperative you not travel alone. However, that doesn't mean your animal guides won't allow you to suffer hardship; quite the contrary. Your guides will ensure your experience hardship, but only is it has something to teach us. 6. They are our caretakers, working to heal us, cleanse us of negativity, and even help to heal physical ailments. For personal experience, there is nothing that makes me feel better after suffering a bought of anxiety or depression quite like visiting my animal guides. 7. They are our instructors. Your guides are there to act as a teacher, not just a mentor offering advice. They will provide you with opportunities to grow as a hedgewitch and person, in a semi-controlled fashion. They will share knowledge and wisdom with you freely, although sometimes cryptic. If they do not know the answer, they will tell you so, but guide you down the right path to find the answers you seek. Our relationships with our animal guides should be treasured and nurtured, just like friendships within our realm. Meeting your animal guides for the first time can be quite simple, however, there will be times animal guides appear to you when you are not actively seeking them. Your animal guides reside in the Lower Realm, so this is where you will have to travel. If you happen to meet an animal outside of the Lower Realm, be cautious. They are likely not an animal guide, but on some off chance they are, they will appear to you in the Lower Realm another time. To meet your animal guides for the first time, set your intention for your journey as follows: "I will journey to the Lower World to meet my animal guide. I ask that may animal guide be waiting for me when I arrive at the Lower World." The first time you do this, you may not meet your guides. 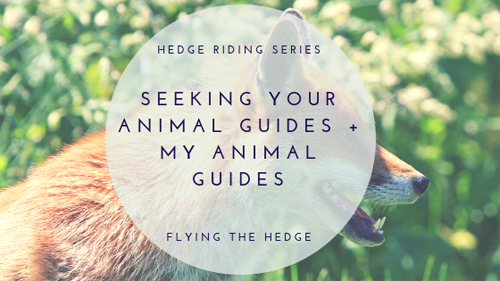 It could take a couple tries to get their attention, especially if you are new to hedge riding. You may notice that your animal guides change with you. That's okay. The animal guides you have today may not be the guides you need in 10 years. You will also likely have more than one, each to teach you a different lesson. Be open and accepting of what they have to teach you. 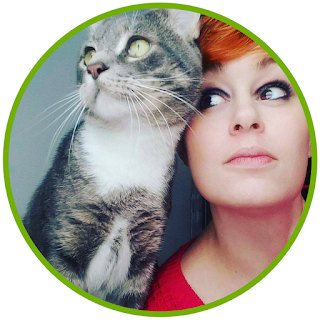 I have briefly mentioned my animal guides before, but I figured I would give a more detailed description of them in this post, with their blessings of course. I have two guides: a female red fox named Meka, and a male raven named Rocar. Meka is by far the guide that shows up the most. She is kind, loving, playful, and wise beyond her years. She is very motherly and extremely patient with me. Meka is often my transportation through the realms and has accompanied me on soul retrievals, chord cuttings, and general journies. Whenever I meet her, she greets me like a playful puppy, bouncing around as if its the first time she has seen me. It's a wonderful feeling to be with her; just thinking about her calms my anxiety and fills my heart with love. My favorite thing to do is lie with her in my Garden within the Middle Realm and stare up at the clouds. It's the most peaceful thing imaginable. Rocar, on the other hand, is a completely different beast. He is loud, rude, obnoxious, and extremely sarcastic. He likes to pick at my hair and face and completely lacks the patience and grace of Meka. He likes to pick on Meka too, often diving down to peck her while we are together, then flying off laughing in a way only a raven can. But Rocar is a wonderful teacher and a reflection of myself. I too am loud, rude, obnoxious, and extremely sarcastic. Whenever I wonder what I am doing wrong, Rocar is there to be blunt and matter-of-fact. His lessons are hard-hitting but valuable. While Meka likes to avoid hurting me, Rocar knows that sometimes pain is the greatest teacher and he isn't afraid to use it on me. At this point in my life, these are the guides I desperately need. Between my feelings of self-doubt and unworthiness, my divorce last year, and the financial and health struggles I have endured, I need someone to love me unconditionally and someone to smack some sense in me at the same time. You will find that your animal guides are there to meet your needs right now, in this phase of your life. Sometimes they are not the guide we want, but the guide we need. It is my greatest hope for you as a hedgewitch that you connect with your animal guides in a way that transforms your life. I cannot express enough how important your animal guides are to your growth and success and I sincerely hope that your experience is as magical as mine.